Credits and Spoiler Alert: I originally heard this story on a 99 Percent Invisible (99PI) podcast, “Structural Integrity.” This letter is a re-telling of that podcast story from memory. To enjoy the “full effect” of 99PI’s masterful storytelling, first listen to the podcast episode. Then check out my commentary below. In 1978, a Manhattan skyscraper almost fell down. This is the story of one phone call that prevented that disaster. Enter the project’s structural engineer, William LeMessurier, with an ingenious design solution to a problem that would have caused most of us to give up and abandon the project. He placed the building on 114-foot stilts, but since the church was in the corner of the lot, he also had to place the stilts in the middle of each face rather than in the corners, where any reasonable person would expect stilts to be. To strengthen the otherwise wobbly design, LeMessurier added an inverted chevron bracing skeleton made of steel and hid it within the “skin” of each windowed face of the building. Because this structural feature made the building lighter than it normally would have been, he added a 400-ton piece of concrete called a “tuned mass damper” to the top of the building, powered by electricity, in order to offset the effects of wind on the building. The building was completed, and all seemed to go as planned. Then a male student in New Jersey called Le Messurier’s office asking if the structural engineer had factored in quartering winds — those winds that hit the building at its corners. He thought those might present a particular concern for the building based on the unique stilt design. LeMessurier hadn’t. Based on his new calculations of quartering wind vulnerabilities, he found that a storm hits Manhattan about once every 55 years with winds strong enough to topple the building. That would be bad enough. Remember this is a 59-story skyscraper that can’t be easily “unbuilt” when a storm comes. But realizing that an essential part of the building’s design was the tuned mass damper, and that the tuned mass damper was completely dependent on electricity, LeMessurier then calculated what would happen to the building if the electricity went out, as is more likely in a storm. A storm with the power to take out the building if the tuned mass damper were rendered non-functional would hit Manhattan every 16 years. As you can imagine, LeMessurier and Citicorp went into action immediately to put in place an emergency plan. Surprisingly, though, they didn’t tell most of the building’s daytime occupants. Under cover of night, and with no press fanfare (there was a press strike), workers began to strengthen the building by welding the chevron bracing skeleton that had previously been fastened by large bolts. The original design had included welds, but LeMessurier had permitted an adjustment by the builder to save costs, believing the bolts to have a negligible impact on the building’s stability. They had completed about half of the repairs when Hurricane Ella began working its way up the East Coast. Just hours away from causing the evacuation of whole sections of Manhattan, revealing to the world the vulnerability of the building, Hurricane Ella veered off into the Atlantic. The hurricane reached record wind speeds in Nova Scotia, but left Manhattan unharmed. The workers finished welding the chevron braces, and the building is still standing today. I know this is true because my nephew sent me a picture from his visit to the building a few months ago. This story went virtually unknown, though, by the broader world until 1995, when Joseph Morgenstern interviewed LeMessurier and broke the story in The New Yorker (“The Fifty-Nine Story Crisis,” The New Yorker, May 29, 1995, p. 45). As 99% Invisible tells the story, though, this is where things get interesting. A Mr. Hartley was watching television when the story broke, and he called to his wife, Diane, “Your building is on the news.” She was upstairs, and, as she tells it, when she turned on the news, she almost dropped her baby. She had been an undergraduate student at Princeton in New Jersey, and she had done her thesis on the Citicorp Center. She had called LeMessurier’s office, and she recalls talking with a subordinate of LeMessurier about the firm’s calculations as well as her concerns about the quartering winds. Had she simply made a mistake in her calculations? A skyscraper couldn’t have been designed by a world-renowned structural engineer and built by a major bank without assurance that it would stand in any conditions. Would it? Could it? Diane Hartley’s Princeton advisor has since revealed that he knows all of the players in New Jersey and has confirmed that there is no other likely candidate for LeMessurier’s “male student.” The conclusion? LeMessurier must have just had a fuzzy fix on the details. As best as anyone knows, it was Diane Hartley’s humble phone call to LeMesurrier’s firm that saved Manhattan from disaster. And she didn’t know it. Diane Hartley had to wait almost 20 years to learn the result of her simple, modest contribution. 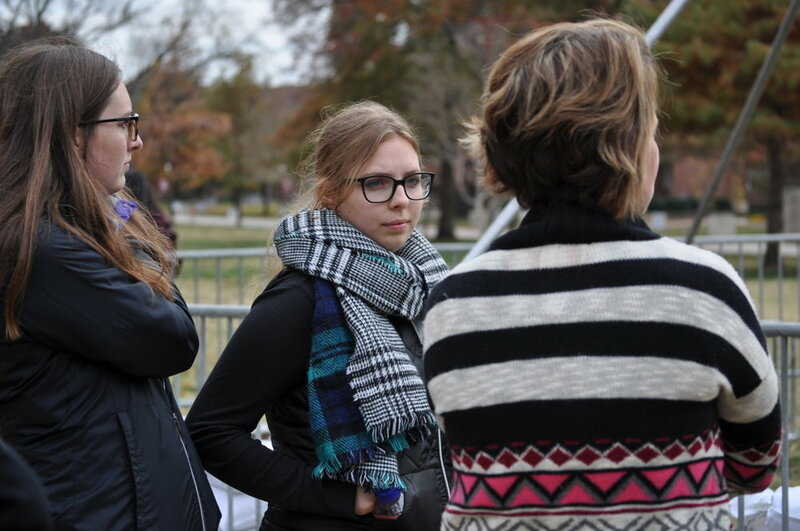 JFA volunteers Natalie (left) and Grace (center) create a conversation at the University of Oklahoma in November 2017. So, what’s the point for our work on behalf of unborn children and their parents? Every conversation we create in order to kindle affection for these forgotten human beings — every conversation — has the power to avert a disaster like the Citicorp disaster. We make humble motions to listen to understand, to ask questions with an open heart, and to give reasons that are persuasive. Yet, like Diane Hartley, we may never know whether our modest contribution will make any difference. We can take heart and continue our work, then, trusting God to use our small contributions to bring about the change in society and in individual lives as he sees fit, with or without telling us. But let us not let discouragement or deception creep in. The stakes are just as high for every human being to whom we speak and every human being on whose behalf we speak as they were for the thousands of Manhattan residents and Citicorp Center workers in 1978. Disaster is on the horizon each day, and we have the key to help. But will we make the call? P.S. 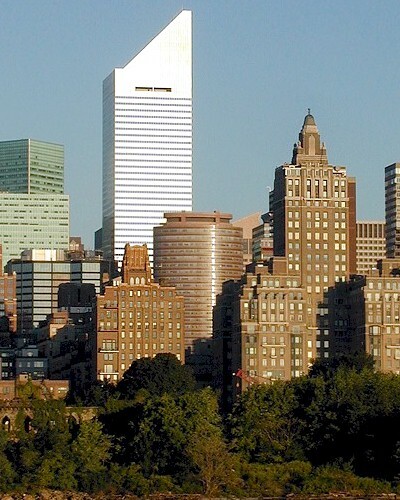 Recently, I’ve been closing many of my presentations with the Citicorp Center story. If you didn’t see the connection to our work until the end, just imagine being in one of our audiences and wondering, “How does this relate?” The elements of mystery and surprise make the important lesson all the more memorable. Feel free to share with others! 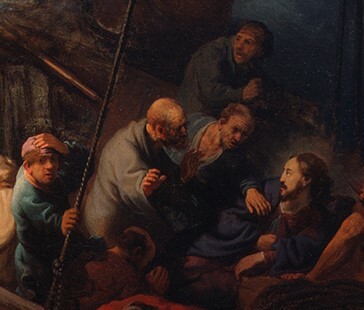 Christ in the Storm on the Sea of Galilee, Rembrandt van Rijn, 1633 (see Mark 4:35-41). Image of the work used here for educational purposes courtesy of the Isabella Stewart Gardner Museum in Boston under CC 4.0. To read the fascinating story of this work's whereabouts, see the Gardner Museum's page dedicated to the unsolved mystery of the 1990 heist in which the painting disappeared. In becoming flesh, Jesus dwelt among the disciples in all of their mess. He was face to face with their fear and their lack of faith, present with them so that they could relate to his glory in a way particularly necessary for them. Jesus related to people face to face. We aspire to imitate our Savior in this simple motion every time we step onto a college campus to try to help some of those who are far from Christ’s perspective come closer to the truth and closer to Christ. We aspire to imitate Christ every time we step into a workshop or seminar to lead a group of Christ’s followers in interactive exercises, preparing them to create conversations. I invite you to look at the art, pictured nearby, again. Reflect on the very special miracle of Christ’s face to face relationship with his disciples which reveals a unique dimension of His love for them (and for each of us). I invite you also to spend some time looking at the pictures from our recent events, reflecting on the striking image you’ll see repeated over and over in those photos, too: we are simply followers of Christ, humbly seeking to relate face to face with people in desperate need, hoping to save very small children and very desperate mothers from the tragedy and horror of abortion. Thank you for partnering with us to train Christians to make these face to face encounters common. Merry Christmas! PS: You can still give a special year-end gift in 2017 using this link. Learn More about "Christ in the Storm on the Sea of Galilee"
This year we wanted to see how many conversations the JFA community could create, so we counted. We’re excited to report that we logged more than 2,017 conversations in 2017. More important than the number of conversations, though, is what’s at the center of each one: a person. I just read through the reflections of one of our dedicated volunteers who participated in JFA events in Colorado, Indiana, New Mexico, and Oklahoma this year. His name is Mark. Some of the 120 people with whom Mark spoke changed their minds and decided unborn children should be protected from abortion. Others seemed unmoved from their pro-choice positions. Yet Mark is not discouraged. He made a list of names and intends to continue to pray for each person with whom he spoke, believing that although good reasons and dialogue are important to helping people change, God is the one who moves in the heart of the person and causes the seeds Mark planted to take root. Click the image above to read the names. Click here for the printable version which you can post on your refrigerator as a prayer reminder. Our staff and volunteers (including Mark) worked together to compile the names of many of these people with whom we were privileged to interact this year. Some were pro-choice. Some were pro-life. Some were undecided or confused or searching prior to the conversation. Please place your trust in God along with us, asking Him to grow in each of these people a strong and active love for those who are often forgotten—for the smallest humans on earth (unborn children), for women and men in distress (related to unplanned pregnancy or sexual assault), and for those whose appearance or worldview makes them difficult to love (such as pro-choice advocates). Pray that each person we talked to this year will take a next step to love the forgotten in the coming months. As you consider your year-end giving, please consider giving generously to JFA to help us train more Christians to create more conversations in 2018. You can give online or send your gift using the instructions at our Donate page. Your gift will help JFA plan more events, hire more staff, and reach more people. Here are just two examples: David Rodriguez and Susanna Buckley served as interns during the fall of 2017, and they have both committed to serve as interns during the spring of 2018. Your gift to the Training Program Fund will pay for their travel to and from outreach events, and it will help us continue to provide a place in the Wichita office where they can grow as dialogue artists and mentors of others. Your gift to the Intern Scholarship Fund will fund paychecks for them or other interns like them. Your gift to the Staff Support Fund or to support a specific staff missionary will fund the salaries of those who mentor these interns. Last month, we shared one beautiful story in which this mentoring made a difference ("Three Miracles in One Conversation"). Our “Invest in JFA” page gives you more detailed information on these and other ways you can make an impact with your gift to JFA. Feel free to use our Contact page to contact me directly to discuss JFA’s vision, strategy, and needs for 2018. Thanks for partnering with JFA! In case you missed it, please read my Giving Tuesday message to all of JFA's readers who serve behind the scenes by praying, supporting financially, providing homes and meals for our traveling team, volunteering during outreach events, creating conversations in everyday life, and supporting JFA in other ways. This message provides important context to my request for year-end gifts above. 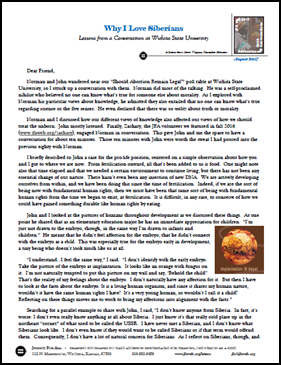 Featured Resource - "Why I Love Siberians"
In his letter this month entitled "Why I Love Siberians," JFA’s Director, Steve Wagner, shares three things that you can use to prepare for conversations: (1) In the third paragraph, he summarizes the case for the pro-life position in a memorable way. (2) He then shares an analogy that builds common ground about the difficulty of seeing early embryos as valuable, but also challenges listeners to let facts determine how they act towards the embryo. (3) Finally, he gives some perspective on how to judge whether or not a conversation is worthwhile. In my February letter ("5000 Conversations in 2017 - Part 1: Outreach Events"), I suggested a few ways you can help us reach our goal of 5000 conversations in 2017, including joining us for a mission trip and connecting us to groups who can join us for outreach. There’s another way you can help us create more conversations: start your own conversations in everyday life. Let’s be honest, though: discussing abortion in everyday life is scary. We fear harming relationships with the people we love most. We fear not knowing what to say. We don’t know how to start the conversation. Let’s talk about each of these challenges. Instead of talking to strangers as we do at JFA outreach events (difficult enough! ), the people with whom any of us are most likely to create conversations in everyday life are friends and family members. Our cherished relationships are on the line. Yet, in many cases it’s precisely because of the relationship that each of us can make a great impact on what our friends and family members think during a conversation. Given the stakes, making a commitment might help. Would you join me in setting a personal goal to create seven conversations about abortion in everyday life this year? We can pray together for God’s help, and our team will do what we can to help, too. If you report back to us, we’ll count your conversations as we assess our progress toward the 5000 target. We also fear we won’t know what to say. JFA can help with this. Every JFA presentation and workshop equips audience members with the ideas and arguments they need to be able to defend the unborn in a winsome, persuasive way. Our online resources do as well. In fact, that’s the main reason we devote time to these activities even when we’re not able to follow them up with an outreach event. We know that many pro-life advocates will never join us for campus outreach but nonetheless can create conversations on their own with friends and family. We want to prepare them. In many cases, the most difficult aspect of having conversations with friends and family is not the ideas and arguments—it’s getting the conversations started! Many of you who support us would be willing to defend unborn children if the opportunity arose. But the opportunity rarely arises! Even as a full-time pro-life worker this is true of my experience in everyday life, so I am guessing it’s probably the case for many of you reading this letter, too. To meet this need, we’re experimenting this year with ways to turn our exhibits and other resources into conversation starters. You’ll always find one new conversation starter in our monthly resource bulletin, “Making Abortion Unthinkable with JFA” (click here to see all of our resource bulletins). In addition to ideas for starting conversations, you’ll also find new ideas each month in two other areas critical for making abortion unthinkable: praying for conversations and preparing for conversations. Let us know what you think of this resource. Each of our trainers will be working to personally create conversations during outreach events this year, and we’ll train hundreds of Christians to join us. The result? Thousands of conversations. What we’re missing from this equation is you and thousands of other pro-life advocates who may never join us on campus, but who can nonetheless create conversations in their everyday lives. Won’t you join us? Pray for Conversations: Steve Wagner and D.C.
Steve Wagner interacts with a student at a Fresno, California outreach. Steve Wagner to Serve as Executive Director of Justice For All from Washington D.C.: Beginning in April 2017, Steve Wagner will make a permanent move to the Washington, D.C. area to continue to serve as the Executive Director of Justice For All (JFA) from there. Steve is excited to begin building relationships to facilitate JFA's outreach work in the region, as well as to continue speaking and participating in JFA's outreach events nationwide. Pray for Steve and the whole JFA team as they work to make abortion unthinkable by creating conversations and by training pro-life advocates to do the same. While JFA will now have trainers focusing locally in four metro areas (Wichita, Dallas, Austin, and Washington, D.C.), and while we will continue to travel to other states and metro areas where we've forged major training partnerships (Colorado, Georgia, and a number of others), JFA is eager to build relationships with churches, schools, and organizations in any region where we are invited to speak to groups and facilitate outreach events with one of our three large exhibits or other outreach tools. Contact Steve with questions or to connect him with friends in the D.C. area who would appreciate JFA. Note: This is the "Pray for Conversations" portion of JFA's March 2017 Resource Bulletin. Click here to see all Resource Bulletins. David, a volunteer at a JFA outreach event (left), creates a conversation with a student in front of the original Justice For All Exhibit. Since conversations about abortion are essential to making abortion unthinkable, we’ve set a goal of creating 5000 conversations in 2017. Let me explain how we plan to accomplish this goal with God’s help. You may be a JFA reader who already supports JFA sacrificially or who prays regularly for JFA. Partnering with JFA in each of these ways is vital to creating conversations and making abortion unthinkable. If you are helping us create conversations through your prayers and financial support, it is enough. (Thank you!) But you may want to do more. As we think about creating conversations about abortion, there’s an unavoidable challenge: abortion just isn’t a topic that lends itself to easy, everyday-life conversation. It’s personal. It’s sensitive. It’s dark. It’s troubling. Many pro-life advocates fear conversations about abortion. They fear they won’t know what to say. They fear losing a friendship. They fear offending someone unintentionally. Opportunities to bring up the topic in a natural way are rare. In this month’s letter, I’ll discuss one remedy we have for this challenge: JFA’s outreach events. In next month’s letter, I’ll discuss our second remedy: JFA’s tools which help you start abortion conversations with friends and family. Our outreach events, especially our large-scale events, are the easiest way for our staff and volunteers to start the conversation about abortion in a way that’s not awkward. As the “Feet Work” part of our training program, these events create an objective spectacle that naturally invites consideration and comment from both volunteers and passersby. The larger the group of volunteers joining us on campus, the more conversations these events generate. Indeed, sometimes the crowd of volunteers itself becomes a part of the reason passersby stop to talk. So, you can help us multiply the conversations these events produce by attending as a mission trip participant and using the event to talk to pro-choice advocates. Here’s one more way you can multiply the conversations our outreach events produce: Introduce us. We can produce more events and larger events if we meet college students who invite us to their campuses and high school teachers and administrators who invite us to train their students through a field trip to a JFA outreach event. Whether we are conducting large-scale outreach events (many trainers and volunteers in conversations) or filling in gaps in our schedule with smaller events (fewer volunteers), please pray that God will help us create 5000 conversations through these events in 2017. Let’s pray also that God uses our conversations to make abortion unthinkable. Attend a JFA mission trip. Introduce us to one church. Introduce us to one college student you know at a large public university. Introduce us to a private high school (Catholic, Orthodox, Protestant, Evangelical, etc. ), homeschool group, or college group which would like to invite JFA to train its students. In my Christmas letter, "Clueless in the Face of a Great Gift? ", I shared an image of a page from The Psalter of St. Louis (image nearby) with the comment that Herod's response to Jesus, to attempt to kill him, was not the "appropriate" response to such a magnificent gift as the incarnation of the Son of God. This is a bit of an understatement, of course. When Herod found that the magi had not returned to confirm for him the whereabouts of Jesus, he sent soldiers to kill all of the males in Bethlehem aged two and under (Matt. 2:16). Could there be a greater rejection of God's great gift than to seek to kill this boy, and indeed, to kill a whole lot of other boys at the same time? Indeed, when women and men prepare to have their unborn children killed by abortion, they are sadly, in the same spirit as Herod, making the same great rejection of a great gift. And when we are silent about the horror of abortion, aren’t we also, in some sense, rejecting that great gift? The challenge of giving any gift is how we will respond when it is rejected, misunderstood, or even maligned. For some of us, perhaps, there is a challenge in giving with a spirit of charity, a kind-hearted desire for the other person's good. I suspect, though, that the greater challenge for most of us is to choose a charitable attitude towards the person once the gift is received, but not as we intended. What will our attitude be if the point is missed, or if the gift is even detestable to the person? In my Christmas letter, I emphasized how patient God is with me when I fail to appreciate his gifts to me. I want to be like him and be patient with those who fail me to appreciate my gifts to them. Any act of conversation about abortion includes the same challenge of “charity after the charity.” We set aside time to go talk to people. Perhaps you have set aside time to participate in a JFA event or to engage someone in conversation using our “Learn at Home” program. What’s perhaps hardest about those conversations, though, is getting them started when we know that those with whom we are speaking may not receive our gift of time, listening, well-chosen questions, and reasons to protect the unborn. We fear the gift will instead be rejected. So, should we simply not give the gift? Clearly not. The gift is worth giving because of the intrinsic value of both the gift and the recipient. Should we mock the person who rejects it? No. This rejection should cause us to be sad, and sad enough that we pray that God would change the heart. See the JFA Event Calendar for upcoming and recent events. See our October 2016 Ministry Notes, which gives a quick visual of our events in September and October. Although this is a fairly good snapshot of the busiest period in JFA's fall, it doesn't include our large exhibit outreach at the University of Oklahoma in November, as well as a number of other events in November and December. See those events here. See our Photos page for photos from our spring 2016 events (and previous). Whether you read JFA’s letters on a monthly or occasional basis, and whether you read them in paper form or online, I hope you see in every communication from JFA our passion for finding pro-choice advocates, starting conversations with them in a natural way, sharing a defense for unborn children, and responding to objections, all within a framework of loving concern. Our work is some of the most difficult work pro-life advocates can do, but it’s also some of the most important, if we are ever to see a day when all unborn children are loved as equals. In our November 2016 Impact Report, “Small Decisions and Big Results,” I share the story of Grace, Clare, and Zachary, and then I close with a comment about the importance of small decisions. As you read the last paragraph there, you might feel like the idea of participating with us “on the ground” creating conversations seems out of reach. Perhaps encouraging your community to learn more about JFA or becoming an intern seems impossible. Still, you can be a catalyst to help make all of these aspects of JFA’s mission happen – by giving financially to support JFA’s work. You can be every bit as much a part of JFA’s mission by making a generous special gift or monthly commitment today. At our Donate page, you can find everything you need in order to become a monthly partner with JFA or to give a special gift. There you’ll also find information about gift designations and what your gift will accomplish, how to give online using a credit card, and automatic giving options. Your gifts to support a staff member designation, our Training Program Fund, our Intern Scholarship Fund, or to support our area of “greatest need” directly impact how many interns we’re able to hire, how many outreach events we’re able to produce, and how many relationships we’re able to build with churches, schools, and other organizations. These things in turn directly affect the number of pro-life advocates we’re able to train and the number of pro-choice advocates we’re able to engage in conversation so that they can come to their own settled conclusion that abortion is unthinkable. Thank you for considering partnering with JFA. P.S. I hope that when you read “Small Decisions and Big Results,” you will be just as encouraged as I was to see active, young pro-life advocates creating conversations that make abortion unthinkable. I hope, though, that you and I won’t stop there, thinking that this is just the job of young people. The task is too big, and the need is too great. Please instead consider a small decision to partner with JFA and trust God with us to use each small decision to bring about the “impossible” result of making abortion unthinkable for millions. Grace Fontenot and Clare Lavergne, two young women from Louisiana, had only been interns with JFA for two months, but they had already been inspired by JFA’s emphasis on creating conversations about abortion every week. The goal? Help those who are pro-choice come to their own settled conclusion that abortion is unthinkable, and help those who are pro-life become active advocates for unborn children. How did Zachary (second from right) get here? Click here to read the story. “After a few surveys that resulted in one lengthy conversation about abortion, we asked a few more students to take our survey, but they declined. So we decided to ask one final person before leaving campus. The student whom we happened upon was Zachary Lee-Watts. Continue reading the story in our short November 2016 Impact Report to see what happened next for Zachary, Clare, and Grace. New Exhibits: Can We Reach More People? In this Impact Report, Joanna Bai (recently married; previously Wagner) shares a story about a conversation at our new Art of Life Exhibit, and other JFA staff members reflect on what it was like to use our new exhibits in April and May to start conversations. You’ll notice a theme: With three large exhibits now in the toolbox, we’re experimenting with ways to reach more people by attracting to the conversation many people we would be unlikely to reach with only one exhibit. At UCLA this spring, “Mark” and “Sarah” came up to the Art of Life Exhibit talking excitedly. As I walked up to them, I overheard Mark mentioning interesting details he had learned regarding the famous paintings by Velázquez and Van Eyck which were prominently displayed on the thirteen-foot-tall panels in front of him. Joanna (light blue) and UCLA students look up at the Art of Life Exhibit panels (above) during a conversation in May 2016. See the Art of Life Exhibit in more detail here. I asked Mark what he thought of the message of the exhibit. In response he said, “Oh, I don't really know what this is at all. I just saw the works of art and got really excited. I had to come over here and see it!” In fact, he had been so excited that he had brought his friend Sarah with him. I suspected that once Mark and Sarah began to see that there was another intended purpose for the exhibit in addition to the art itself, they might lose interest and walk away. But much to the contrary, both remained interested throughout my whole tour of the exhibit, and as interestedly as they had shared their artistic knowledge, they began sharing their views about abortion with me. Both were pro-choice, but they did not hold identical positions. I talked with them for a significant amount of time. My recollection is that it was at least an hour, and Sarah and I were so engaged in dialogue that she skipped one class, and I ended up walking her to another class that afternoon as we were still finishing. Tammy Cook opens the original JFA Exhibit Brochure to refer to pictures of human development in a conversation with a UCLA student at JFA’s new Stop and Think Exhibit. Rebecca Haschke was interviewed by student television during the Art of Life Exhibit at CSU (April 2016). Watch the coverage here. JFA trainers Catherine Wurts (second from left) and Jeremy Gorr (right) dialogue with UCLA students about abortion at the Art of Life Exhibit in May. Note: Although the actual date of this posting was December 15, 2016, it was back-dated to the original date the letter was sent to supporters. Meredith Boles, a recent graduate of UCLA and member of Live Action UCLA, tells about her recent experience with JFA and JFA's new exhibits, including a conversation with a young woman named Amanda. Read her story in JFA's August Impact Report, "How JFA Helped Me Reach My Campus." Note: This post was backdated from December 21, 2016 (its post date) to August 21, 2016 (the publish date of the Impact Report) so that it would appear in the blog on approximately the date it was sent to supporters.